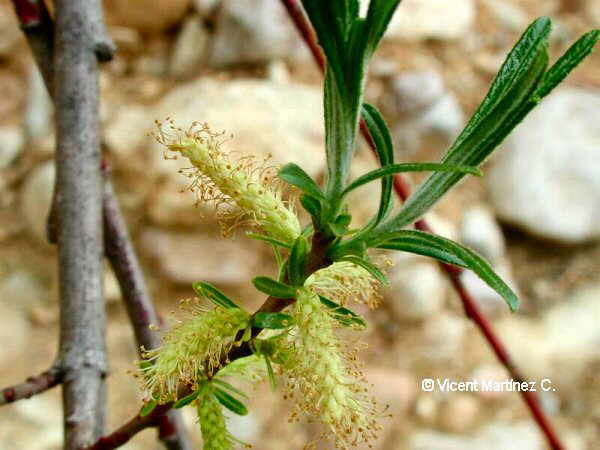 Photo of Salix eleagnos Scop. Perennial shrub of the Willow family – salicaceae – up to 6m. Erect stems, flexible; younger ones generally reddish, sometimes yellowish. Linear-lanceolate leaves, green on both sides, toothed at the tip and with revolute margin. Catkins till 6 cm. By the streams. Sometimes cultivated because of its branches.